Aww yeah.... Jovino and I had a fabulous evening out in SF! We started with a delicious dinner at Chow - one of our favorite SF restaurants, then headed over to Cafe du Nord for a night of awesome NERDCORE! We got there a bit late so only caught the last bit of Schaffer the Darklord, but he was really good, and I bought his CD so I could hear more of his music. He has a hilarious song about Craigslist! Also had to get Front's new CD and it's really good. 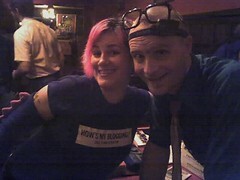 There was a really funny song called "I Hate Your Blog" and since I happened to have my "How's My Blogging" shirt on, I had to ask Front to pose with me for a pic. Front was as awesome as always, and his band was great too. He did ALL of my favorite songs plus a bunch of new material. For about half of his set he was determining which song to do by rolling a d20! I do love the nerdcore! It was cool that the opener was so good, I like this genre a lot and we need more folks making this kind of music so that there is enough of it to spin! Right! Should have thought of that. BTW we are going to be doing movie nights over here every other Thursday starting next week! You should totally come. OMG, I would love to see that! Which song would you use? There is much on the east coast. I'll keep you posted! but just wanted to let you know about it, that and that dyslexia was super impressed with your victory and that I knew a winner! woot! That sounds awesome! I can't wait to hear about it. I am planning to go to LA to compete in the one in February there, where I fully expect to get creamed - it'll be great anyway. I went to a really good gourmet cheese store. I'd had the idea to use these roasted mushrooms (crimini, which are "baby portobello") that I'd recently made and really loved. So I had one ingredient in mind when I started. I explained about the contest and said that I was planning to use the mushrooms in my sammich, and asked for recommendations. I tasted a bunch of cheeses, picked out two I liked which were both really different, then bought some 6 year old cheddar just because I love a nice sharp cheddar. Spent more than I'd planned on - but I'd fallen in love with the expensive Testun de Barolo and had to have it! You can do it! Go, girl!